Alejandro Amo and Ramiro Larrain are Microesfera, part of Buenos Aires’ techno scene since 1997. Along with Gustavo Lamas, Leandro Fresco and others, Microesfera is one of the southern cone most visible and forward thinking electronica dance acts. Always on the edge of music production, Alejandro and Ramiro have also produced more experimental fare as Vlisa (their beat less alter ego), becoming in the process a top electronic music production team in Argentina. Taking the techno vein and slashing it with house and micro sounds, Microesfera started releasing EP’s on independent labels in their country in the late 90’s. After that they self released the “Illusion” album on their label Droop Discos in 2002 a year after their “Reconstrucción” album for their Vlisa project. 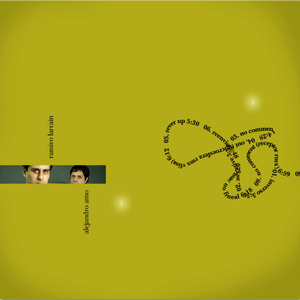 In 2005 Microesfera released two EP’s on Japan’s Mule Electronic label (with by Mike Shannon and Gustavo Lamas) which are distributed worldwide by Kompakt. As restless thinkers that Alejandro and Ramiro are, Microesfera projects always have some type romantic concept behind the music, lacing their releases with an almost innocent sense of criticism and humor. Their debut album for Static Discos, “Negative”, is a collection of tracks which are transmuted into micro techno sounds that create a reverse mesh of avant dance aesthetics. “We wanted to do a dance album for Static Discos, but with a strong concept behind it”, explain Alejandro and Ramiro. “We knew from the start that we wanted to call it ‘Negative’, taking into account all the things that are negative for us but that are positive for others. In general the tracks are full of many backwards sounds; we played with the inverse and reverse of sound, trying to temporally break the linearity of the music. We wanted to go back in time, to be negative and positive, to create bisexual sounds while at the same time trying to be conscious of our own ambivalence. We tried to create feedback music for ourselves, writing the music backwards, just to see what would happen”. “Negative” succeeds in many levels, creating an original sound that is analog and digital at the same time, full of perky details that have to be listened at very close range as voices hush strange things into the ear. To an extent, there is a direct rawness to each of the tracks, as sounds appear and disappear, break away and come back in a different forms. What appears to be simple ends up sounding complicated and vice versa. The mini album completes itself with 3 remixes from up and coming Latin American producers, Receptor (Chile), Fax and Latinsizer (both from Mexico). The digital release boasts a fourth remix by Vlisa, as Alejandro and Ramiro, end up remixing themselves in a never ending pattern of techno mirrors. Stream on Spotify or buy on iTunes, Beatport or Amazon. Or get Compact Disc through Darla.